RedBeam Check In/Check Out - comprehensive PC application and easy-to-use barcode scanners. With RedBeam Check In/Check Out you can track file folders, tools, videos or other rental items, equipment or product samples using this comprehensive PC application and easy-to-use barcode scanners. The software is a complete item database with the ability to use either cabled barcode scanners attached to PC workstations or scanner-enabled mobile computers. Enter employees, members, customers or students and check items in and out to them using the barcode scanner. Report on which items are checked out and to whom. Monitor overdue items, rental fees, item usage and more. 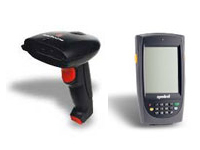 Barcode circulating items and the ID badges of your employees, members, customers, or students. All Redbeam Software ackages come with barcode labels that can be printed to your standard laser printer. Use a barcode scanner to scan the ID of the person checking the item in or out. Then scan each item to complete the transaction. Generate useful transaction reports and print or export to Microsoft® Excel. Report on checked out and overdue items, usage by person, project, or department, rental and overdue fees and more!